If you are preparing for your next Core Java interview and looking for some common question to practice or check your knowledge then you have come to the right place. In this article, I'll share 50 Core Java Interview Questions from various companies. I have already discussed the answers to these questions in this blog or Javarevisited, so I have just put the link. First, you should try to answer it yourself and if you cannot then go to the link and find the answer. You can also compare your answer with mine and learn a few things here and there. In most of my interview post, I have also shared some common techniques to drive interview towards your comfort zone and how to leave a long-lasting impression on the interviewer, you can use those techniques to do well on your Java interviews. These questions are useful for both freshers and experienced Java programmers, mostly 2 to 5 years of experience. It also covers all important topics for core Java interviews e.g. Java Fundamentals, Java Collections Framework, Java Multithreading and Concurrency, Serialization, Design Patterns, and JVM and Classloading. hint: part of JVM which loads bytecodes for classes.You can write your own. hint: you can use bitwise operator e.g. bitwise AND &, remember, even number has zero at the end in binary format and an odd number has 1 in the end. hint: all differences between List and Set are applicable here e.g. ordering, duplicates, random serarch etc. hint: many ways e.g. using Enum or by using double-checked locking pattern or using nested static class. hint: when you need to instruct JVM that a variable can be modified by multiple threads and give hint to JVM that does not cache its value. hint: when you want to make a variable non-serializable in a class which implements the Serializable interface. In other words, you can use it for a variable whose value you don't want to save. hint: totally different, one used in the context of serialization while other is used in concurrency. hint: No, because it's not visible in the subclass, a primary requirement for overriding a method in Java. hint: several but most important is Hashtable is synchronized while HashMap is not. It's also legacy and slow as compared to HashMap. hint: List is ordered and allows duplicate, Set is unordered and doesn't allow duplicate elements. hint: Many, but most important is that ArrayList is non-synchronized and fast while Vector is synchronized and slow. It's also legacy class like Hashtable. hint: The wait() method releases the lock or monitor, while sleep doesn't. hint: notify notifies one random thread is waiting for that lock while notifyAll inform to all threads waiting for a monitor. If you are certain that only one thread is waiting then use notify, or else notifyAll is better. hint: to be compliant with equals and hashcode contract which is required if you are planning to store your object into collection classes e.g. HashMap or ArrayList. hint: The threshold which triggers re-sizing of HashMap, generally 0.75 which means HashMap resize itself if it's 75% full. hint: same as an array and linked list, one allows random search while other doesn't. insertion and deletion easy on the linked list but a search is easy on an array. hint: PATH is used by the operating system while Classpath is used by JVM to locate Java binary e.g. JAR files or Class files. hint: Inheritance allows code reuse and builds the relationship between class which is required by Polymorphism, which provides dynamic behavior. hint: No because overriding resolves at runtime while static method call is resolved at compile time. hint: from Java 8, the difference is blurred but still a Java class can implement multiple interfaces but can extend just one class. hint: DOM loads whole XML File in memory while SAX doesn't. It is an event based parser and can be used to parse a large file, but DOM is fast and should be preferred for small files. hint: throws declare what exception a method can throw in case of error but throw keyword actually throws an exception. hint: fail-safe doesn't throw ConcurrentModificationException while fail-fast does whenever they detect and outside change on underlying collection while iterating over it. hint: Iterator also gives you the ability to remove an element while iterating while Enumeration doesn't allow that. hint: A Map which uses == equality operator to check equality instead of equals() method. hint: A pool of String literals. Remember it's moved to heap from perm gen space in JDK 7.
hint: Comparator defines custom ordering while Comparable defines the natural order of objects e.g. the alphabetic order for String. hint: It doesn't support because of bad experience with C++ but with Java 8, it does in some sense. Only multiple inheritances of Type is not supported in Java now. hint: In case of checked, you must handle exception using catch block, while in case of unchecked, it's up to you, compile will not bother you. hint: both are errors occur in a concurrent application, one occurs because of thread scheduling while others occur because of poor coding. Thanks for reading this article so far. 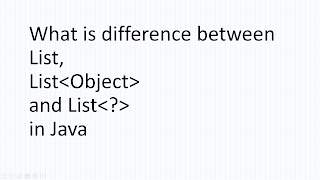 If you like these Core Java Questions then Please share with your friends and colleagues. If you have any questions or feedback then please drop a note. I hope that Answer for the question 29 is Wrong , When we declare a class as Final, We cannot inherit the class . This is a Simple solution for the question . There is no need for "Private" Constructors as We cannot inherit Constructors .